Bradleys was opened in 1991 by the family team of Simon and Jolanta Bradley. Simon is the chef, and trained at The Intercontinental Hotel in the days of Peter Kromberg, prior to branching out on his own. The Bradleys wine list featured just over 100 bottles, ranging in price from £14 to £150, with a median price of £29.50 and an average mark-up of 2.7 times the retail price, which is moderate by London standards. There was a very wide choice under £40. Example wines included Omrah Pinot Noir Mount Barker 2010 at £28.50 for a wine that you can find in the shops for around £13, Chorey Les Beaune Domaine Maillard Pere et Fils 2009 at £47 for a wine that retails at around £19, and Ridge Montebello 1999 at £110, which is barely more than its shop price. A nibble of salmon and tomato fishcakes was pleasant, the fishcakes cooked fresh and having fairly crisp exterior, though the flavour was quite subdued (13/20). Bread was bought in, and the focaccia that I tried was rather dried out, though fruit and nut bread was rather better. 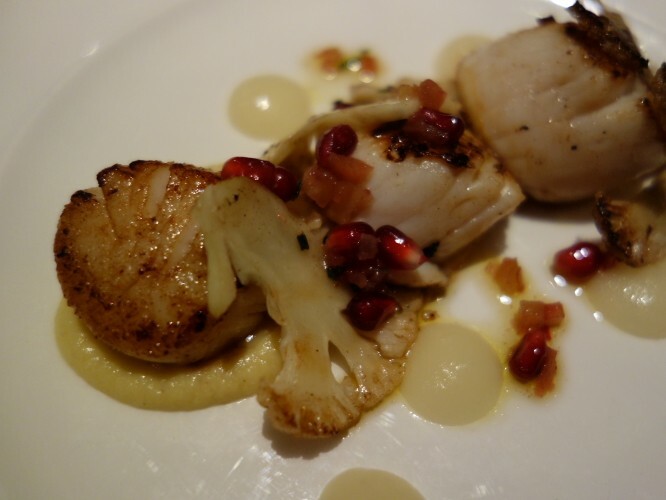 Scallops (£9.50) were carefully cooked, pan-fried and served with a cauliflower puree with separate apple puree and a garnish of pomegranate seeds. This was a nice combination of flavours, the apple giving a little acidity, the cauliflower an earthy note (14/20). 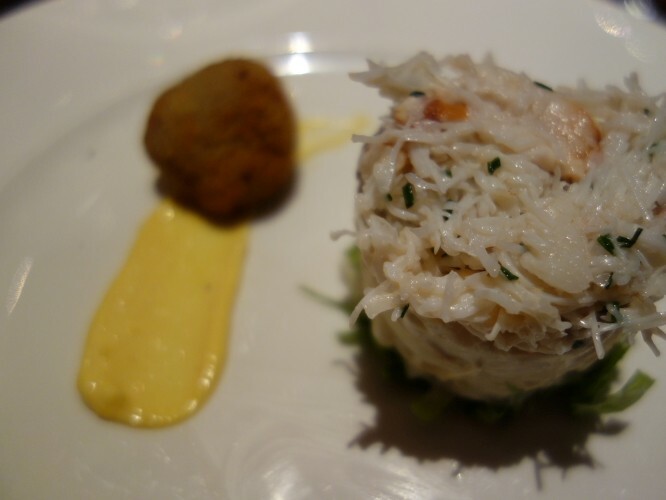 This was better than crab with a base of celeriac remoulade, which was under-seasoned with a few pieces of crab shell and celeriac that was a bit too firm in texture (12/20). 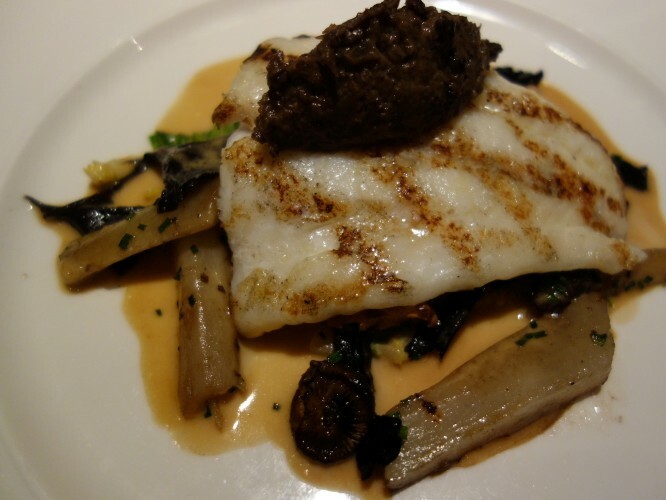 For my main course (£19.50), turbot from Brixham had surprisingly limited flavour, was a little under-seasoned and also slightly overcooked. The creamed cabbage and salsify it was served with was fine, and perhaps the best element of the dish was a mushroom duxelle with quite concentrated flavour; however at the end of the day the fish was a little lacking in flavour (12/20). 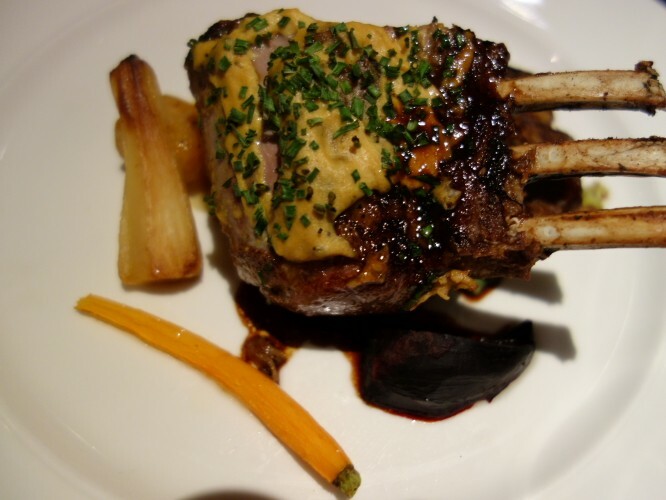 Much better was lamb from the Orkneys, served with garlic puree and caramelised root vegetables; the lamb was nicely cooked and had plenty of taste, and the garlic puree packed a punch (14/20). 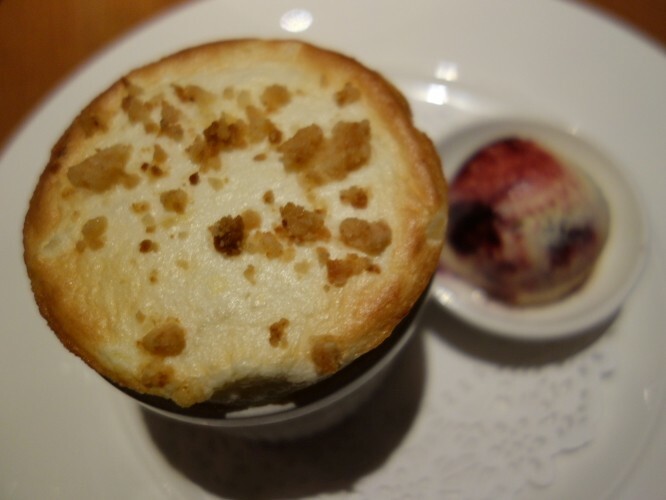 Apple crumble soufflé (£8.50) was an interesting idea but although cooked through was over-sweet: the crumble pieces could be tasted but the apple was scarcely present, not enough to balance the sweetness; blackberry ripple ice cream was also oddly subdued in flavour, the fruit flavour hardly coming through (12/20). 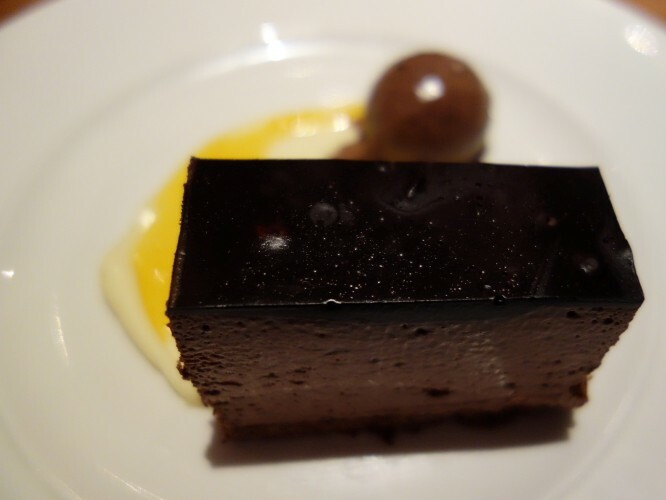 Chocolate pave with white chocolate mousse and chocolate orange sorbet was a little better; the slab of chocolate having pleasing texture and quite good chocolate flavour, the orange sorbet providing some balance (13/20). Coffee was fine. Service was pretty amateurish this evening. There were gaps in taking the order, difficulty in getting the attention of the waiters, who seemed unable to answer any questions about the dishes, and at one point the wrong dish was delivered. It was all friendly enough, but not very professional. 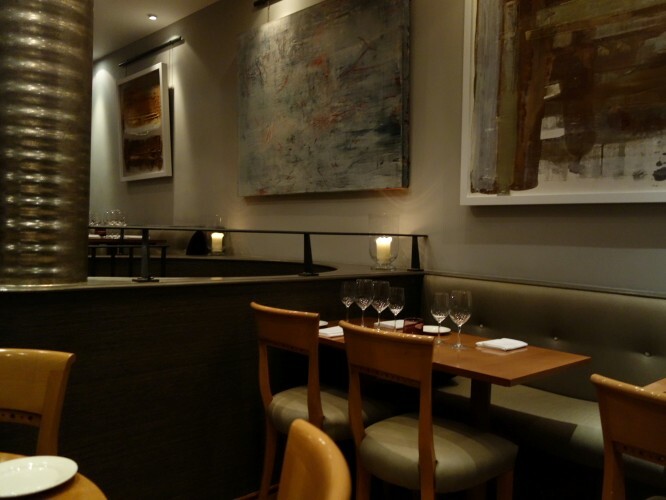 Three courses will typically come to around £37 per person before coffee, service and drinks are added, so with a modest wine the bill will realistically end up at around £70 a head. Bradleys has an appealing menu, makes some effort to get reasonable ingredients and demonstrated a generally very competent level of cooking. There were some inconsistencies, which should not really happen at this price point, but certainly this was an enjoyable meal, and is well above average for a local restaurant.